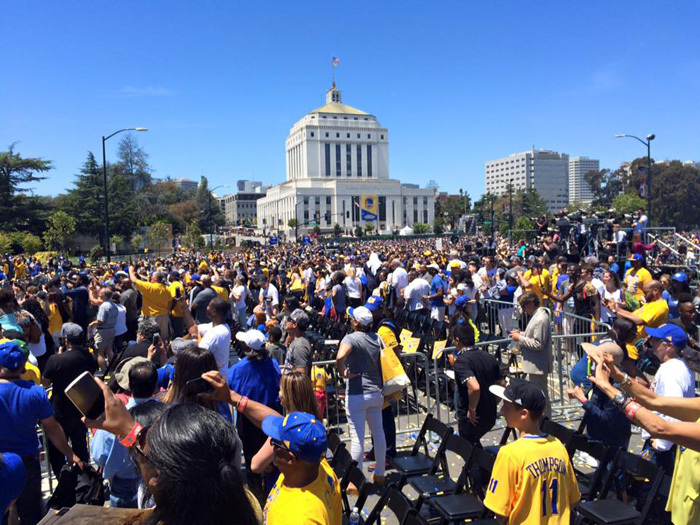 It’s been called, somewhat cleverly, the “Million Fan March.” Last Friday’s Warriors Parade drew an estimated 1.1 million people to Oakland to celebrate the city’s newly-minted NBA Championship trophy. The parade capped a dream season which saw the Dubs rise to legendary status, compiling one of the best records ever in NBA history, and convincingly out-Splashing four other playoff teams to earn the title. The parade meant everything to the Dub Nation, who descended on the Eastlake lawn in a swarming sea of gold and blue, but it might have meant even more to Oakland, a perennial underdog who finally emerged from the long shadow cast by San Francisco to recast its identity as a winner. 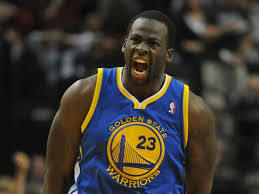 Though the Warriors’ surname says “Golden State,” this was an Oakland team, through and through, exemplified by the trash-talking, swaggering Draymond Green, a classic overachiever who backed up his lip service and attitude with on-court bravado when it mattered most. Throughout the season, longtime Dubs fans traded war stories about the days of Run-TMC, and 2006’s “We Believe” squad, or even the 74-75 unit captained by Rick Barry which was the last Warriors team to win an NBA championship, some 40 years ago. Those with even longer memories might have harkened back even further, to the shortlived American Basketball Association’s Oakland Oaks. But never in the team’s history as the Bay Area’s professional basketball franchise had it had a team as talented as the 2014-15 edition. Perhaps even more important than talent, though, was the team’s unselfishness and chemistry; in a league where sniping at teammates is par for the course, the Warriors played nice with each other all year long. To win the championship, the Dubs overcame a slew of doubters, none more prominent than TV analyst Charles Barkley, who predicted incorrectly that jump-shooting teams don’t win championships. What Barkley didn’t realize, though, was that prolific offenses who also play excellent defense have historically had a statistical advantage in winning NBA titles. (But then again, as Green pointed out,$ir Charles never won a ring, so how would he know?) In any event, it’s likely their success will alter pro basketball trends, as teams seek to match their versatility and assemble lineups which can excel in small-ball finesse. The Warriors also had to overcome their own doubts. A young team, they lacked significant playoff experience, and it showed at times. But they adjusted to adversity and overcame obstacles both real and imagined, even down to the final showdown with the Cleveland Cavaliers. Like a boss battle in a video game, the Warriors figured out a way to beat LeBron James, the self-proclaimed “best basketball player in the world.” They won, ultimately, by rising to the challenge at critical times, and by playing as a team – a message to other ego-driven, superstar-oriented NBA franchises. Sure, there were some dazzling displays of ballhandling and shooting by league MVP Steph Curry, but it’s completely Oaklandish that renaissance man Andre Iguodala, a force at both ends of the court, won playoff MVP honors. In the final game, “Iggy” hit just as many three-pointers (three) as Curry, a testament to the emotional leadership he provided all year. 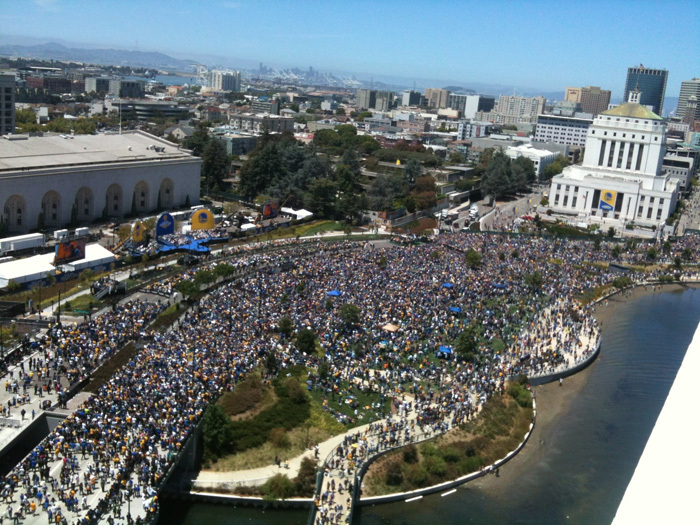 The massive turnout for the parade and rally was almost three times the size of Oakland’s population – an indication that the Dubs’ bandwagon had swelled with every thrilling victory in an 83-win season. Many in attendance had not even been born the last time the Warriors won an NBA title. While sports fans can be brutish and belligerent, especially after drinking since 5 am (which is when crowds began to arrive at the rally site), the assembled masses on Friday were generally well-behaved, even though the crush of population density threatened to flare tempers and/or result in claustrophobic episodes. 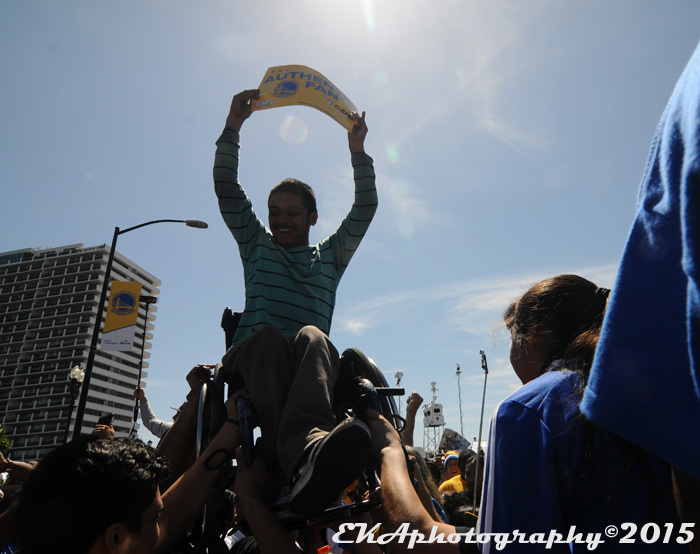 One example of the compassion Warriors fans hold in their hearts came on the Lake Merritt Drive overpass. When the parade concluded, the overpass was packed with people, including young children and babies in strollers. There was scant elbow room. As the rally started, it became apparent that not only were the people on the bridge not going to be able to move any further forward, but only those up in the front would actually be able to see what was happening. At that moment, several hands appeared to hoist up a young wheelchair-bound fan above the heads of the crowd, so he could view the proceedings. That right there says all you need to know about the nature of the Dub Nation. The championship and the parade take on an even greater significance because of the very real possibility that this is the Warriors’ last season in Oakland. Talk about going out on a high note. Yet the season and the celebration will continue to live on, quite possibly in mythical terms. It’s something, as Iguodala pointed out in a post-Finals interview, that can never be taken away. This championship, it must be said, belongs to Oakland. Oakulture has already pointed out the cultural significance of the Warriors, and their resonance has grown exponentially with them securing the trophy. It’s a measure of how exciting they were that this year’s Finals garnered the highest TV ratings in 17 years; their deeds won’t soon be forgotten. 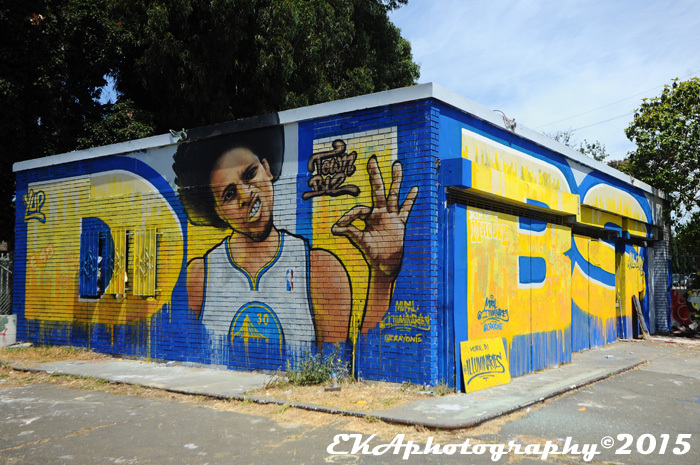 Like folkloric heroes, the Warriors have been celebrated in song—mostly rap songs, which is another Oaklandish trait—as well as in visual art, through the creation of the now-famous “Mac Tre” mural in West Oakland, painted by Crayone and the Illuminaries, which has become a must-visit location for Dubs aficionados. 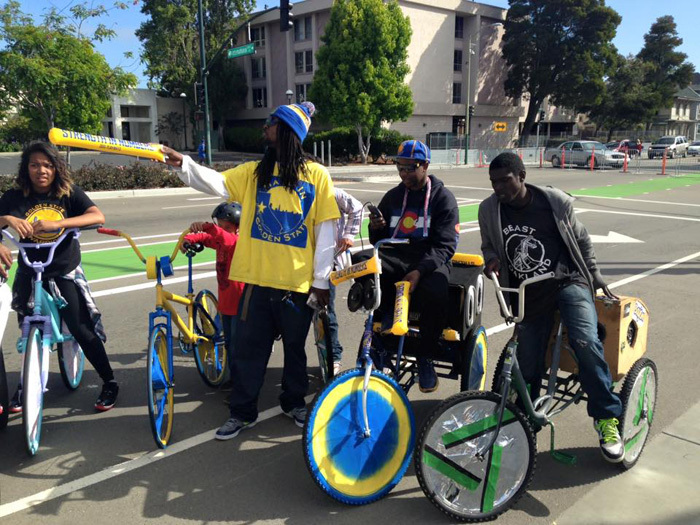 They’ve also made an impact on fashion, and inspired entrepreneurship from a score of independent artisans and designers – some of the various t-shirts include Hiero– and Wu-Tang-themed designs, Eesuu Orundide’s “Oaktown Splash,” and one proclaiming “East Oakland Warriors” in the old-school font they used during the 74-75 season. They even inspired the Original Scraper Bike Team to paint their rides in team colors. No longer are the Warriors the laughingstock of professional sports, the team nobody wanted to play for. The days of wondering who the team would pick in the draft lottery—only to see that player either fail, or become a star on another team—are over. Children will grow up with the memory of this season and be inspired to achieve great things. 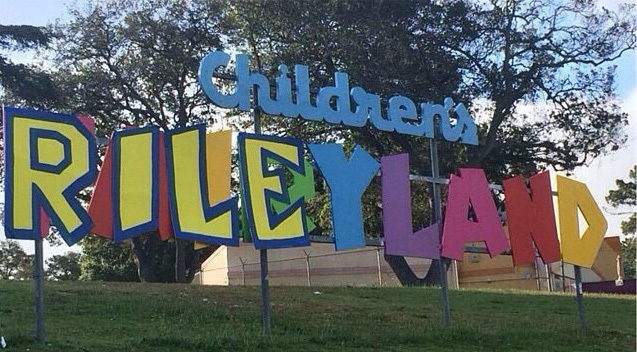 Heck, Curry’s daughter Riley not only already runs the world, but also inspired a cute reinterpretation of the Fairyland sign. That’s quite fitting, because this dream season resembled nothing so much as a fairytale. As to where the story goes from here, well, there is much left to be told. 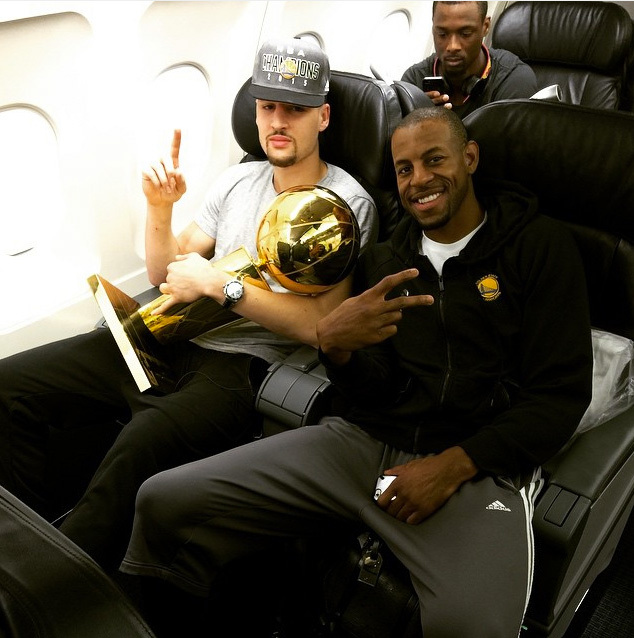 If they keep winning, the Warriors could add more hardware to their trophy case. In the meantime, they have provided the most concrete proof to date that Oakland is a major-league city, one which breeds champions. 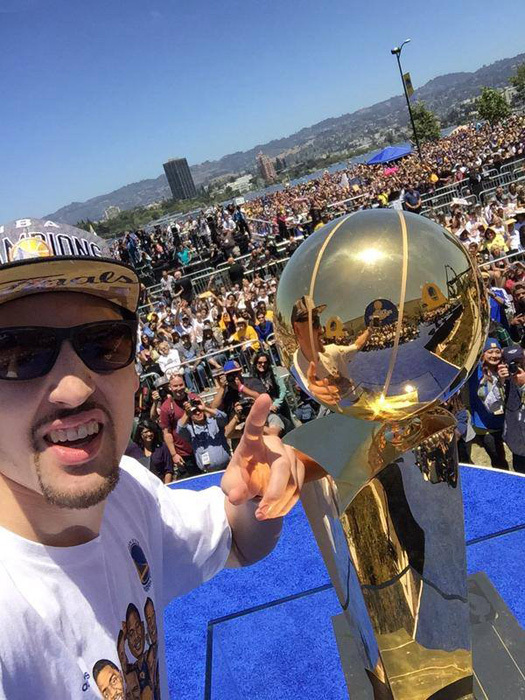 Categories: Event review, Sports | Tags: Crayone, D Labrie, Dub Nation, East Oakland Warriors, Golden State Warriors, Illuminaries, Million Fan March, Oakland Oaks, Oaktown Splash, Rileyland | Permalink.